The morning was cool -- frost on the car windows and seeing one's breath sent "chills" through everyone. Now, instead of rain gear, everyone is layering it up with all the fleece and long sleeves that we can put on and still ride. The route out of Edenton took us pass some of the old homes that date back to the Civil War and before. Beautiful stately old southern houses complete with balconies circling the front at both the first and second floor. Imaginations run wild trying to visualize what it was like as the southern "belles" with hooped skirts flirted from the top balcony to a young suitor below. Edenton was also the home of Joseph Hewes, a signer of the Declaration of Independence. Although born in New Jersey and a graduate of Princeton, he amassed his fortune in North Carolina in shipping. Once out of town and into the countryside it wasn't long before we needed to cross the Albemarle Sound. The only way to do it without getting wet and swimming was to cross the 3.5 mile bridge. The bridge fortunately on a early Saturday morning was barren of much traffic, so the pedaling was actually enjoyable. There were the customarily warnings about wind, but today all was quiet. The view from the summit was fabulous. Next stop -- Pleasant Grove a town advertising a grocery store. At one time in the life of the town there probably was a store, but today it was only a ghost of a building showing signs of being long closed. A few trailers and an abandoned farm house appeared in the horizon, but any sign of life was not there. A little further down the road came Mackeys, a town in very much the same condition. Life has just long since gone away. Now Plymouth had life -- a great lunch stop!!! A small cafe/bakery on the Roanoke River was the perfect spot to settle into for a meal. The air temperature today was not warming as the sun got higher into the sky as it had in the past. 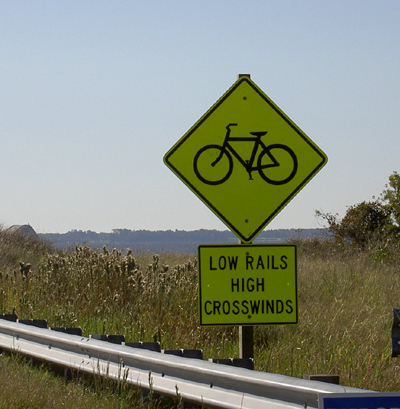 Instead, the wind would blow directly into one's face removing any heat that might have been built up by pedaling. The sight of a warm restaurant was a welcome oasis!!! Back out on the road with all the peanut and cotton fields showing the way but this time with the wind promising to make the afternoon an interesting venture. No matter what direction the road headed the wind blew the opposite making pedaling a trial. The roadway also pitched slightly up no matter than 1 degree but it prevented any coasting. Wind in the face, road pitched slightly up, pavement rough and rutted -- oh the afternoon was so much fun. Exhausted and hungry the group settled into the hotel in Washington, NC. 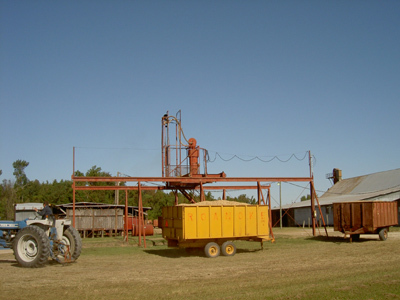 The town is small and like most in this part of the state deep into history. 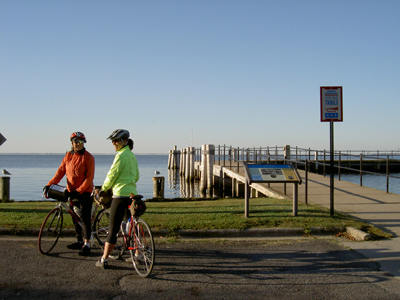 Situated on the Pamlico River, it is the first city in America to be named for General George Washington. 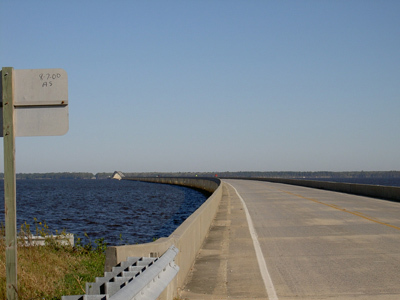 Sign Before Crossing 3.5 Mile Bridge!! Frankie: "Nancy, Help - My Brakes are Stuck On!!" 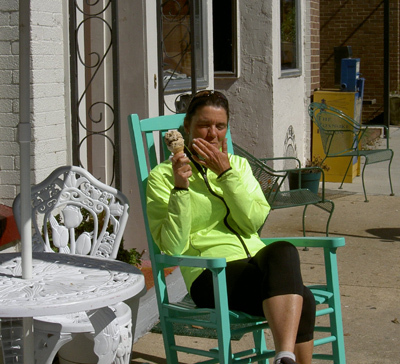 Nancy: "I Am Not Really Eating Ice Cream!!"